Using a plastic bag for cooking or just using low temperatures – Sous-vide and low-temperature cooking methods represent different beliefs on how to prepare mouth-wateringly tender meat or fish. 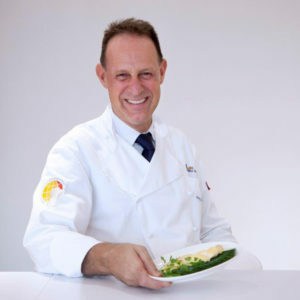 Stefan Grammel is a supporter of the sous-vide method, whereas Fritz Gross is a fan of low-temperature cooking. Both work as Executive Chefs at LSG Sky Chefs. Stefan: When using the sous-vide method, my food cooks slowly in a sealed bag and keeps all its flavors and vitamins inside for maximum flavor. I prefer this way of preparation because the contents cook by themselves in a water bath. All you need to do is adjust the time and temperature. There is no stirring or flipping required. Sous vide takes out a bit of the chaos of a kitchen by allowing food to cook overnight or even over a couple of days. Fritz: Low-temperature cooking also means reduced stress in the kitchen. This cooking method uses sophisticated convection ovens that use steam and low temperatures at the same time. That means that you are able to have very accurate temperatures from 60° Celsius and up. Instead of drying out the protein with dry heat, you use low-temperature steam until you reach the required core temperature. It’s similar to sous vide, but without the bag. And it has a clear advantage in comparison to sous vide: You can program the oven for the last 10 minutes to give a very hot, dry heat to roast the meat or fish and give it a great aroma. For which products is your cooking method ideal? Fritz: Low-temperature cooking is ideal for all proteins (whether meat or fish) where you need to reach a certain core temperature. Steam penetrates very quickly into the protein even though we use low temperatures. You can try it out with any portion of fish which is not pan-fried, but rather marinated and steamed. Or, you can take a chicken breast which is first pan-fried and then bring it up to a core temperature of 74 Celsius using low-temperature steam. Big cuts like roast beef, lamb shoulder and pork shoulder also work very well using this methodology. 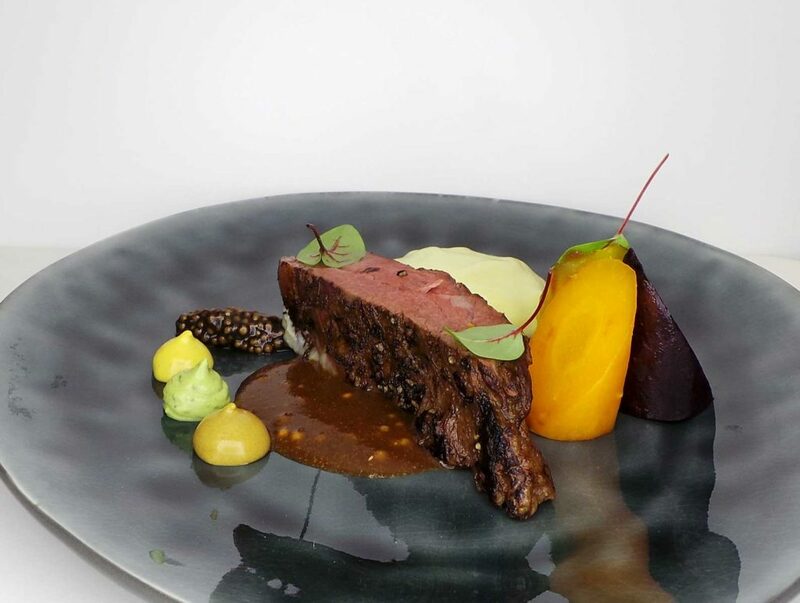 Stefan: My favorite dishes using sous vide are 48 hour Short ribs, 7 hour Iberico Pluma or Pike Perch cooked in Beurre Noissette. You just need to keep in mind that the capacity of the bag is limited and that you shouldn’t add anything that needs either a lot of water to cook or soaks up a lot of water during the cooking process, for example dried rice or noodles. Is your cooking method also applicable in airline catering? Fritz: Yes, of course you can use low-temperature cooking for airline catering. You just need to follow food safety regulations. For us, that means that we need to adhere to HACCP 03 to ensure the right core temperature of the meat or fish. Stefan: Galleys in airplanes do not have a water bath yet, but we can still use the technology on board. It works well with single-portioned vacuum bags which can be regenerated carefully in a standard airline-catering dish that has been covered with a lid or aluminium foil. The bag needs to contain a lot of liquid. Otherwise, you would burn the product in a dry heat. Alternatively, you can use sous vide to pre-cook products on the ground then unpack and deliver them on board. So, which method is better overall? 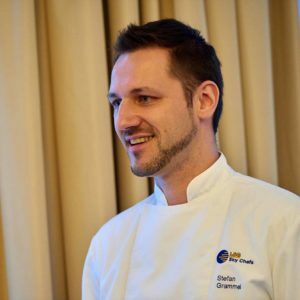 Stefan: Cooking slowly – either by sous vide or low-temperature cooking – will for sure become more and more popular in the future. The possibilities to create tasty meals this way are just endless. In fact, you could even prepare a cocktail sous vide. Fritz: Both cooking methods have their advantages. In the end, it just depends on if you want to use a plastic bag or not. LSG Sky Chefs is Officially on Instagram!